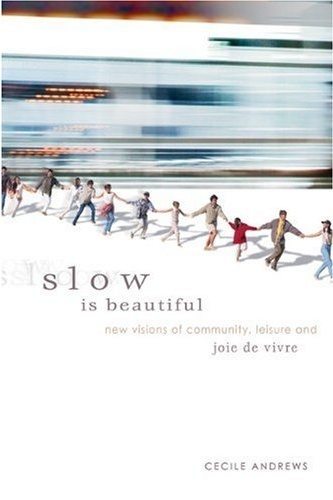 I always have about 4 or 5 books going at the same time at my house, and one of them right now is the book “Slow is Beautiful – New Visions of Community, Leisure and Joie De Vivre” by Cecile Andrews and I recommend it to anyone who thinks that the high-paced, fast-moving community of today is only going to end in one giant burnout. Although I definitely do need to slow down a little more often, it is something I am working on and trying to be more aware of in my life, and reading books such as this one help me to remember what else I am supposed to be doing other than staring at the computer screen all day. The slow movement is not so much a “slow down when driving” thing as a “slow down when going through life” thing. Cecile Andrews talks about an experience with an SUV driver screaming and throwing raisins at someone because the person was taking too much time to park their car when she realized that our community has turned on itself all in the name of speed, money, status and greed. I tend to agree. The haves are having more and more while the have nots are losing even more ground. People are buying McMansions so their neighbors and families will think that they are rich, corporations are giving multi-million dollar bonuses to executives who fail while cutting bonuses and health care for their employees who do the actual work. Instead of helping each other out, it seems that a lot of people are only out for themselves while ignorantly speeding along towards their own demise. Not stopping to play with their kids, take a look at nature, enjoy a sunset…just gotta keep buying, consuming, earning, stealing, DOING. As long as they are busy, it is harder to see just how unhappy they really are with their choices in life. As I work towards leading a simpler life one day, reading these books are important because I think they keep me grounded and keep me from falling into the trap of buy, consume, spend, buy, consume, spend. Living here in L.A. right now it is very easy to see what every one else has and find yourself unconsciously longing for it as well. This book seems very interesting. I took a course in voluntary simplicity a few summers ago, and I was always shocked at how much happier I actually was with less. Fewer things meant less clutter, fewer clothes meant an easier time picking things out in the morning, and fewer posts on my itinerary meant more time to just be me. I look forward to reading this book and learning more about how slowing down can also help to simplify life.